Our charming outdoor Cosco Outdoor Living 3 piece Metro Retro nesting bistro steel patio furniture set is perfect for the apartment or cozy outdoor spaces. Two lovely slat-back arm chairs and an oval pedestal-style slat-topped table fit comfortably in your small space, making it truly delightful. When not in use, simply slide both chairs easily up to the table where they nestle in like puzzle pieces. Now the unit is compact and out of the way. This steel set is weather-resistant and durable. Arrives fully assembled. Luxurious wicker dining set with 8 chairs and a square table with a decorative, tile top. The frames are durable and painted in a espresso finish. The comfortable lumbar pillows are made of weather-resistant, outdoor olefin fabric. This set presents a stylish, transitional design just right for your outdoor living spaces. Floral Blossom 5-Piece Patio Dining Set with 48-inch Round Table, Arm Chairs and Umbrella in Black By combining outdoor elements such as ceremonial and abstract floral designs, the Floral Blossom Dining Set by Home Style is brought to life. 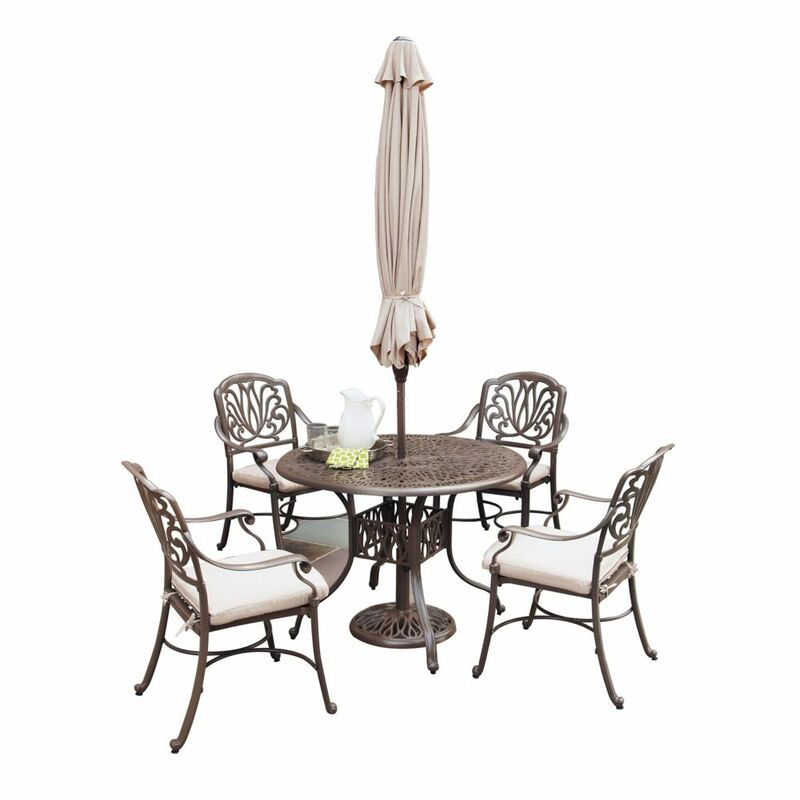 This set is constructed of cast aluminum in a powder-coated taupe finish. Floral Blossom 5-Piece Patio Dining Set with 48-inch Round Table, Arm Chairs and Umbrella in Black is rated 1.0 out of 5 by 1. Rated 1 out of 5 by EmptyPatio from The only thing good about this item was the delivery man. The fabrication of the metal finish ha... The only thing good about this item was the delivery man. The fabrication of the metal finish had numerous defects on every piece. The chair leg/arm pieces were uneven and could not be attached to the frame. We tried for over an hour. The cushions should be called chair pads as they were very thin. We put it all in the car and took it back to the store. The refund was processed efficiently, but now we don't have a patio set.